Moodle 3: How to Add Extra Credit Items? If you would like to give a student extra points on a grade item, you can edit the student's score by adding those points to it, and Moodle will calculate it accordingly. Example: If a student scores a 97 out of 100 on an exam, and also got the 5-point bonus question correct. You can type in 102 for that student's exam score, and Moodle will calculate it as 102%. Moodle allows for extra credit items to be added into your grade book. You can place the extra credit item in a category that you create if you would like the extra credit points added toward that specific category total, or you can place it in the parent course category and the extra credit points will be added to the course total. NOTE: When Moodle calculates a total for a category, it first processes all of the non-extra credit items. Any extra credit items are then added to that subtotal. For example, a category having 3 grade items (a 90 out of 100, a 100 out of 100, and an extra credit item worth 3 points) will first process the non-extra credit items (the 90 and 100 will have a simple weighted mean score of 95.) Then it will add the extra points to the subtotal (95 + 3) to get a category total of 98 points. 1. Log in to Moodle, and open the desired course. 2. 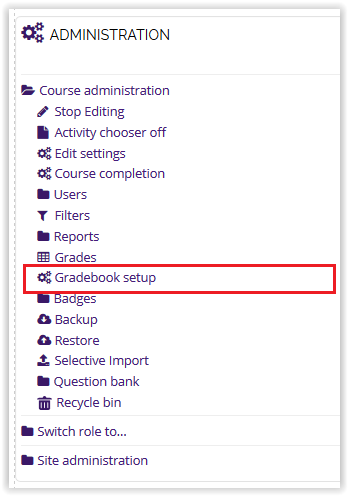 Select Course Administration, then click Gradebook Setup in the Administration block on the left side of the page. 3. To add a new Graded Item, click the Add graded item button located under the Gradebook. NOTE: There are three different Aggregation Methods to calculate grades in Moodle: Custom Weights, Natural, and Weight by Points. How you will add extra credit depends on which aggregation method you choose. For example, in Custom Weights option, the number of extra credit points that you put in your gradebook will be percentage points. 4. Enter a name and maximum grade (the number of extra credit points you would like to give for this item). 5. Select the proper category from the Grade category menu at the bottom of the page, then click Save Changes. 6. Once the item is created, select Edit at the far right of it, then click Edit settings. 7. Check the box next to Weight Adjusted in the Parent Category section. 8. Check the box next to Extra credit in the Parent Category section. 10. Extra Credit should appear in the Weights column to the right of that item.